Unique Pens recently came out with new fountain pen which is a quite subtle design. I quickly grabbed the pen as soon as Mr. Subramanian of ASA Pens shared the image of the same with me. 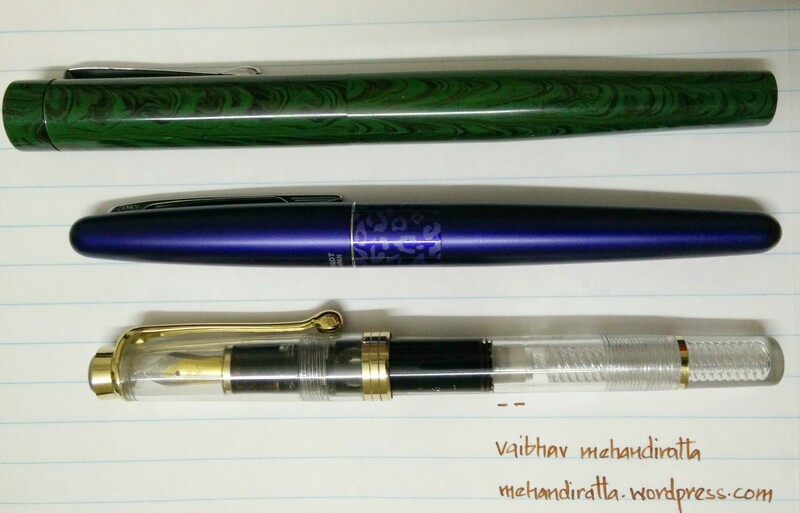 Below is my review of the pen which i have been using for past 2 weeks. I purely bought this pen for its looks and after my first demonstrator which was Galactic, i wanted to explore the territory of demonstrator pens. This pen is a small sized sleek piston filler pen. It comes in 5 translucent colors, Clear, Blue, Red, Green, & Brown. Out of all those Clear looks the best because it shows you the actual color of the ink sloshing inside the pen. It also comes in solid colors by the name of Tulip. The pen is made of ABS plastic which is quite okay. it is an elegantly designed little pen which will be suitable for people with small and regular size hands. 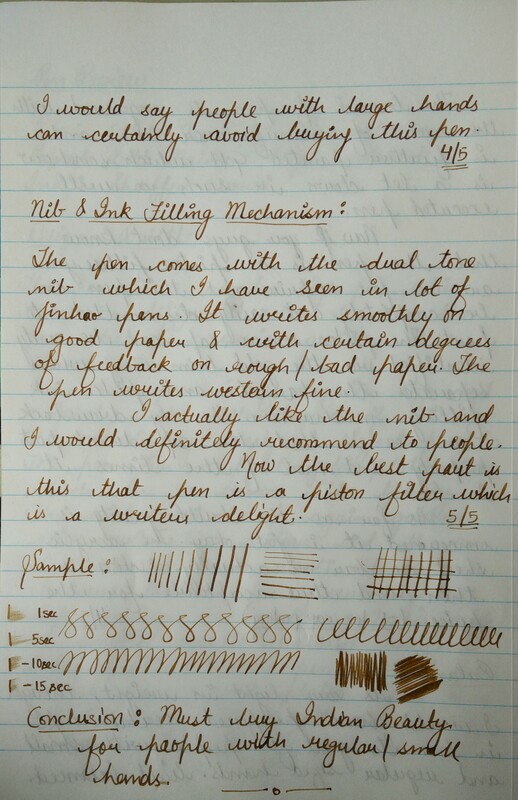 The pen is prone to smudges if you have oily hands. The cap has metal gold plated crown shaped cap which is quite firmly placed on top of cap. There is center band with 2 grooves also running around again in golden color. 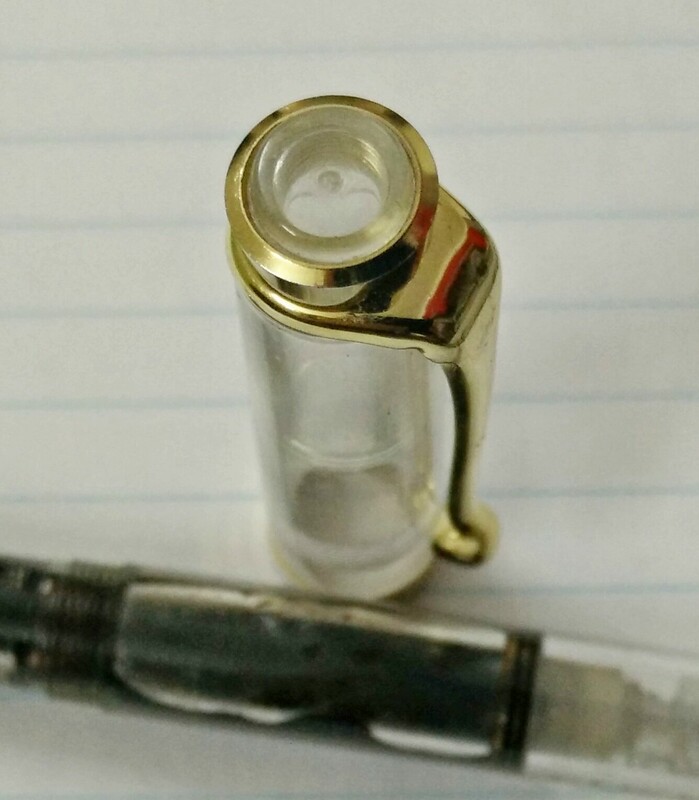 There is also inner lining of plastic inside the cap, probably to keep ink from drying out. 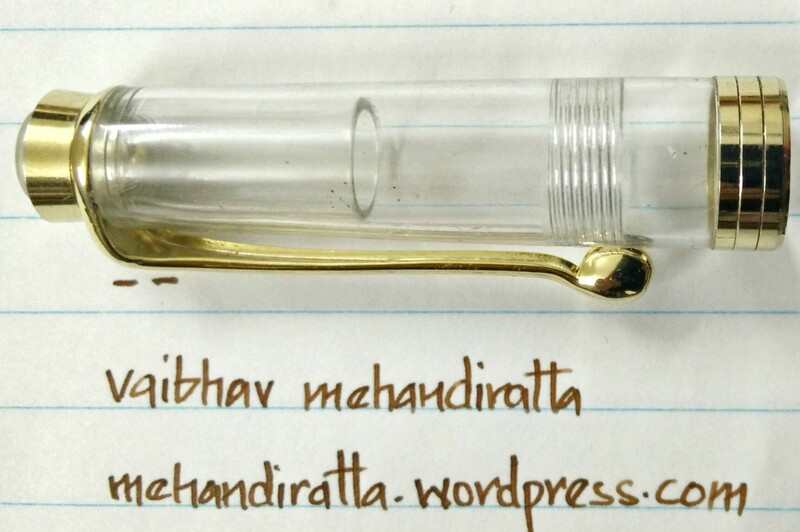 The pen opens in 2-3 turns and top of grip section also has gold plated metal ring which ads to the beauty of pen. The only let down i see the gold paint over the engraving done at the barrel which doesn’t appeal to me. Also in above image you might see one more gold plated band which separates the barrel section from the piston filling mechanism. I must tell you that i love the piston filling mechanism better than eyedropper. This pen can be easily cleaned as it can be easily dismantled into individual parts. The build quality of pen is just okay as the ABS plastic used looks flimsy even though it might take lot of falls and has certain bit of flexibility also. It gives you a feel that if you try to manhandle the pen it will come apart. So i did not messed around with the pen. 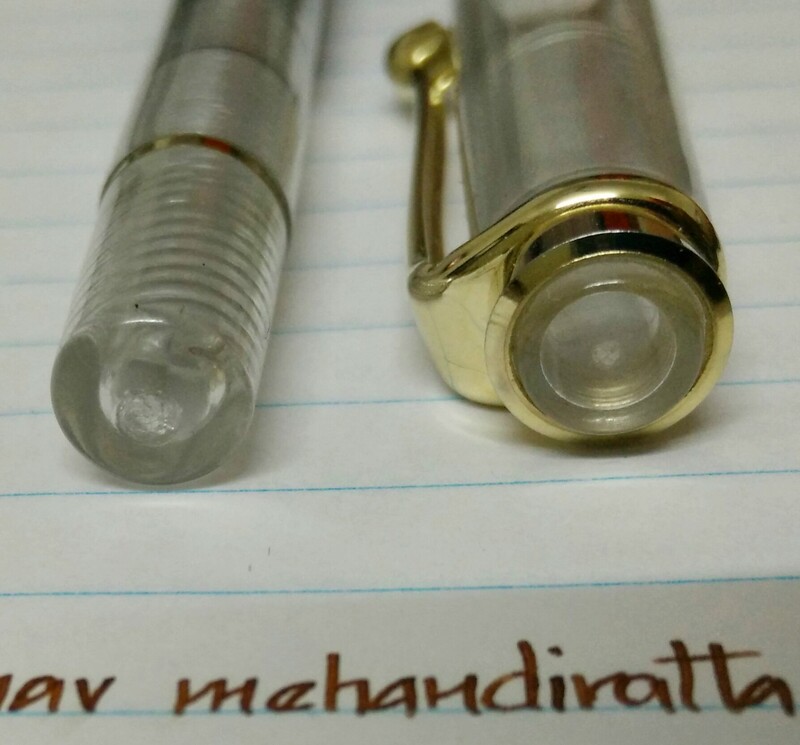 The bottom of pen and top of cap are flat and are pretty neat and clean. Overall the design is good and build quality is acceptable for price range of Rs. 150 (US $ 3). I must add that the build quality is far better than Hero Demonstrator B001 pen I have. Also it can be compared to plastic used in Jinhao 599 pens. The pen is i would say for only small and regular sized hands. As the cap posting is not good so the you will not be able to attain the long length which can be used by bigger hands. 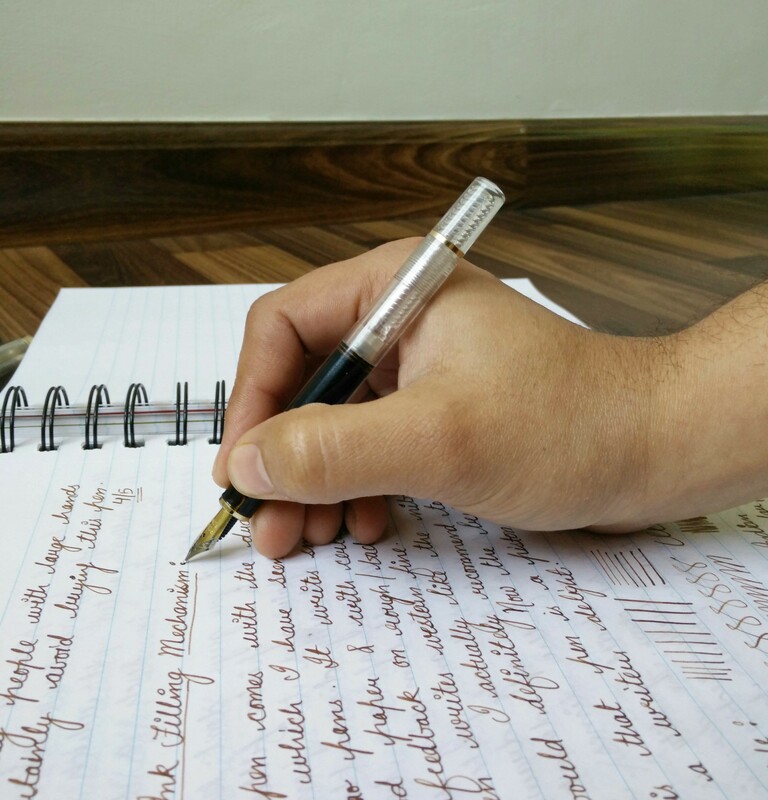 Though the pen is light weight, i still believe that there is certain lack of heft in the pen. Section grip is smooth acrylic which is of correct size and might trouble some with sweaty hands. Only drawback it has is that the cap can’t be posted as it comes out easily when you try to post the cap. Thus recommended for small or regular sized hands. Overall its nicely balanced pen. 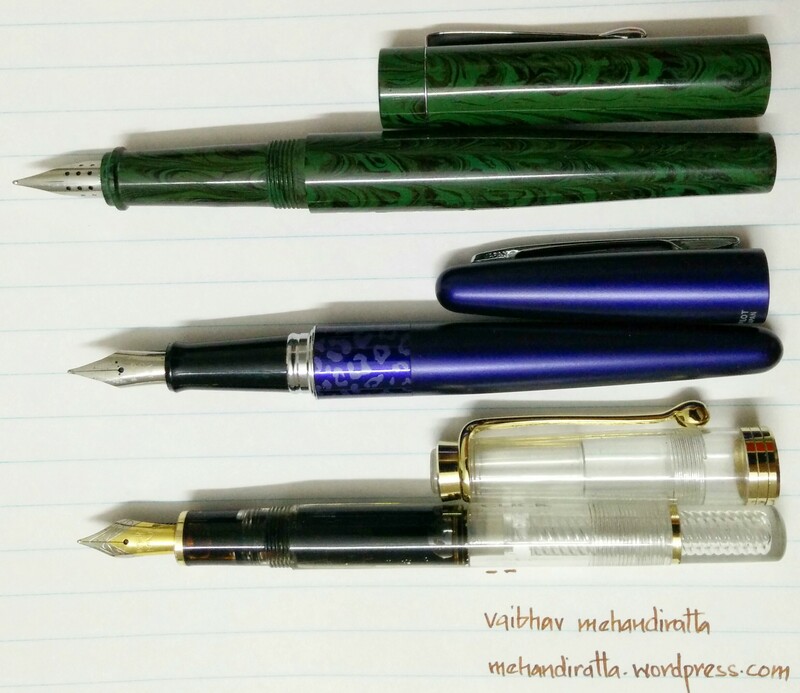 Below are few images showing comparison in sizes with other pens. 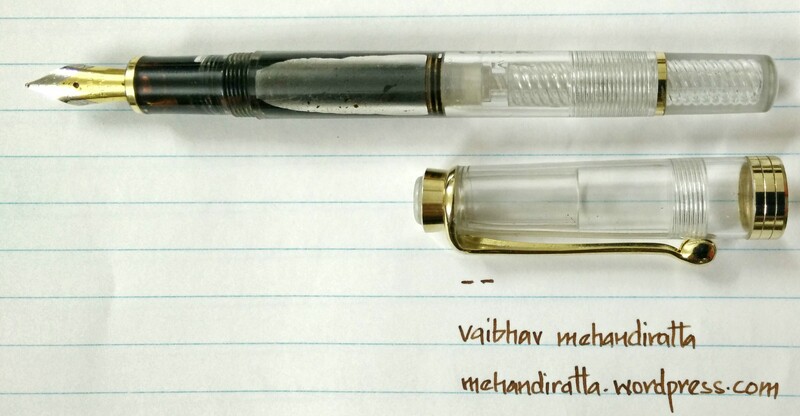 As you can see the in the image above and below it is a tad smaller than Pilot Metropolitan aka MR. 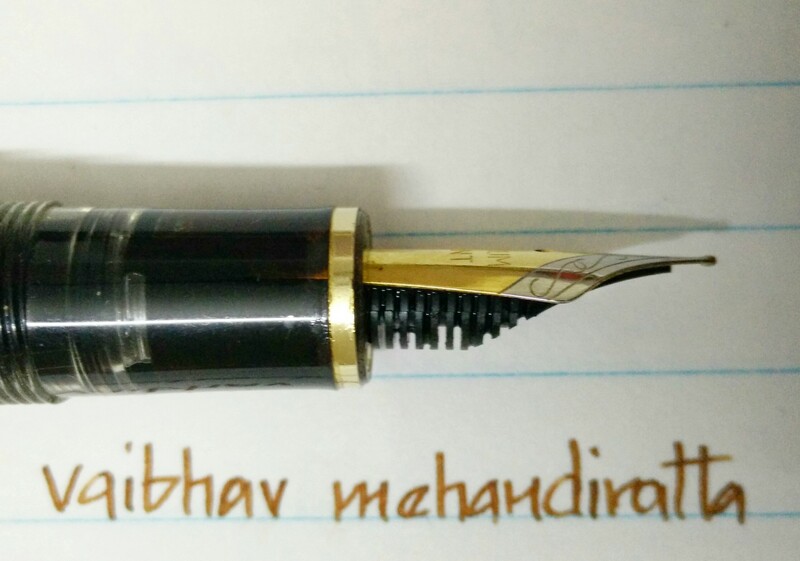 The pen comes with dual tone fine nib which writes pretty well and actually it never skipped during my course of writing with this pen for past 2 weeks. 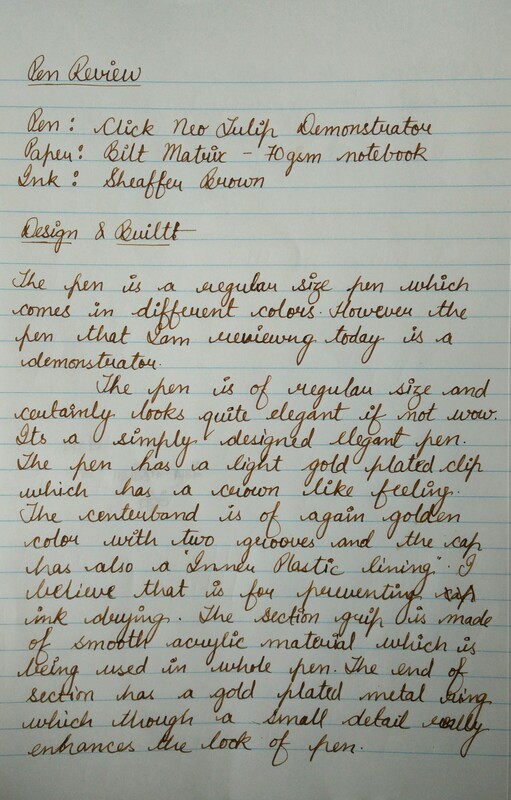 The nib writes western fine and the feeder is made of ebonite. 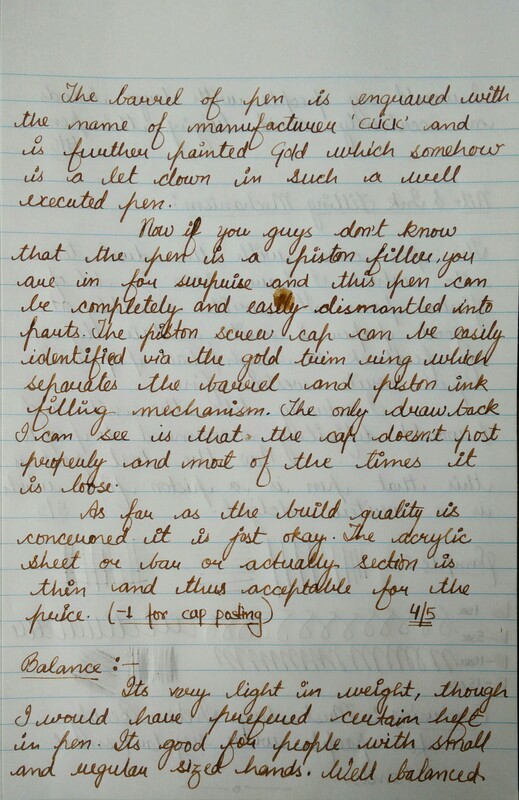 The dual tone nib really complements the gold metal trims of the pen and the nib also has got some variations, it is not flex but yes it has got certain variations if you even write with just a bit of pressure applied. 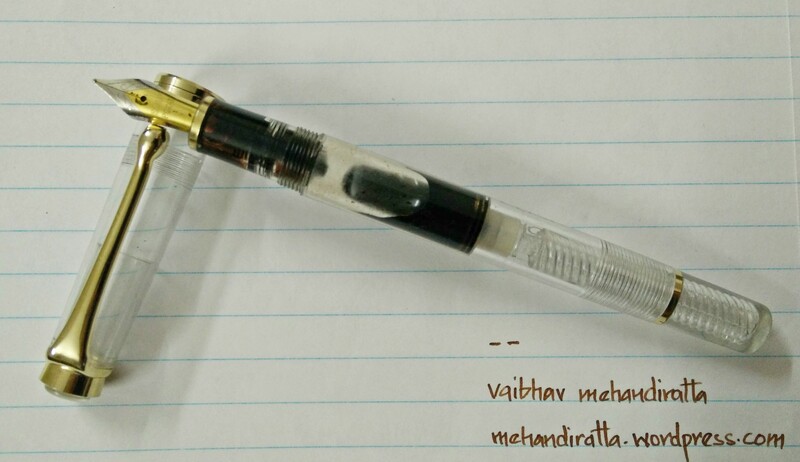 The ink filling mechanism is the Piston Filler this is my second piston filler pen and actually i love this most as compared to other mechanism of ink filling. The best part about the pen is that it can be easily dismantled for cleaning. 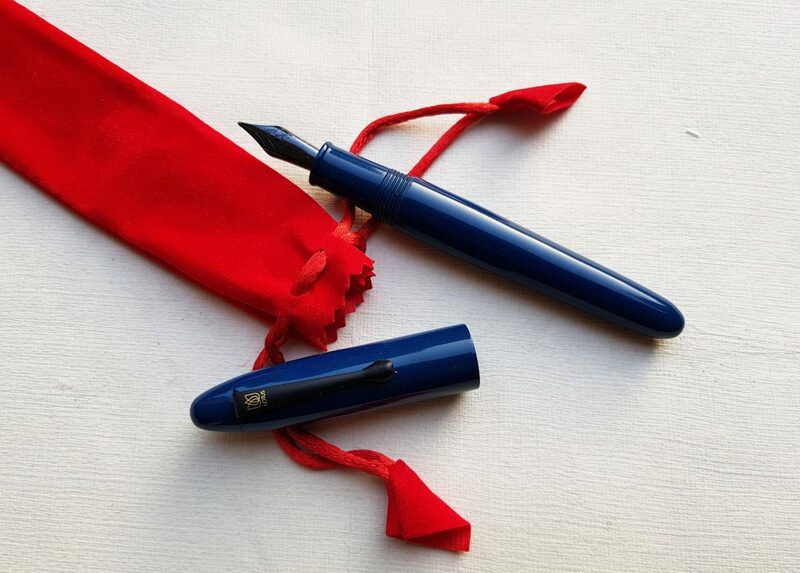 The pen comes in only one nib option and certainly nib can be changed aftermarket if someone desires. 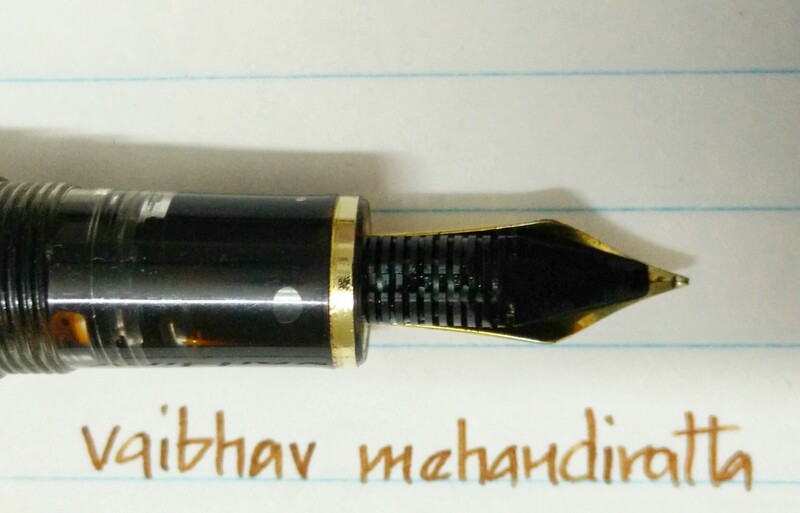 The stock nib writes medium wet and easily dries up in Delhi Summer weather within 8-10 sec and yeah a lot depends on ink also. Yes there was certain burp which happened for first time(See Page 2) in past 2 weeks but but hasn’t happened since then. Well made Indian pen for Rs. 150 ( US $ 2.5) which writes quite well. 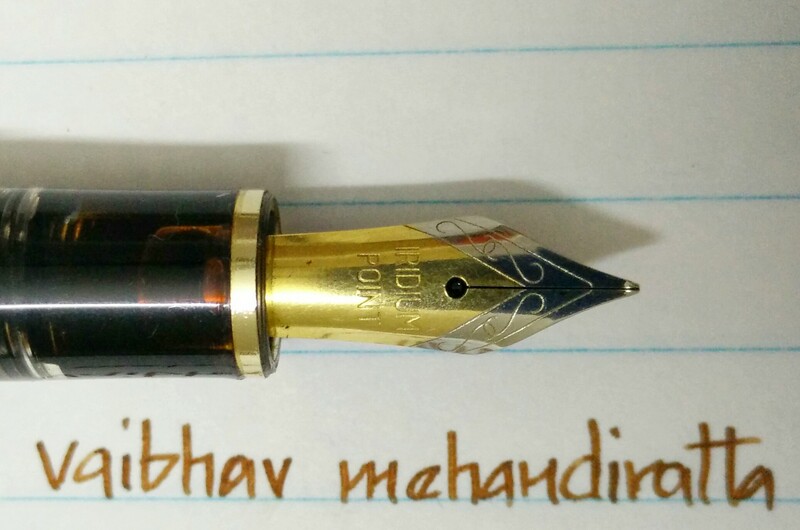 Surely recommended to people who want to try out fountain pen or grab value for money fountain pen which writes quite well. 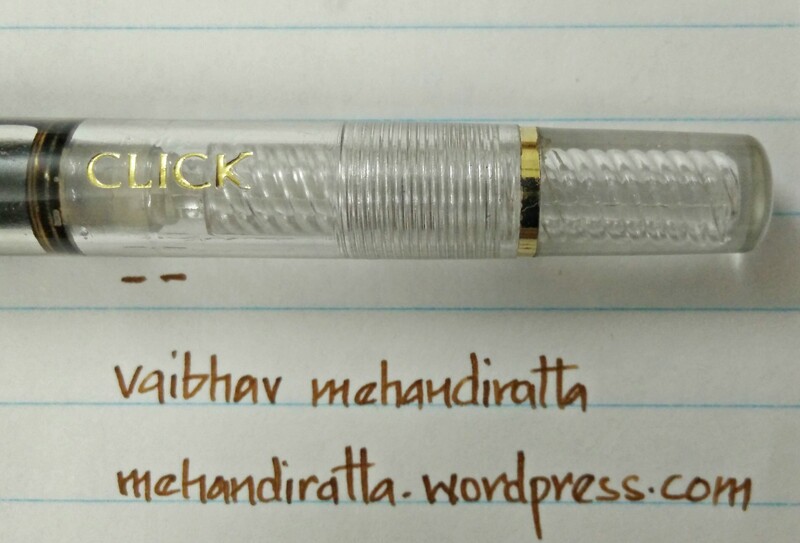 It is a brilliant pen for its price. 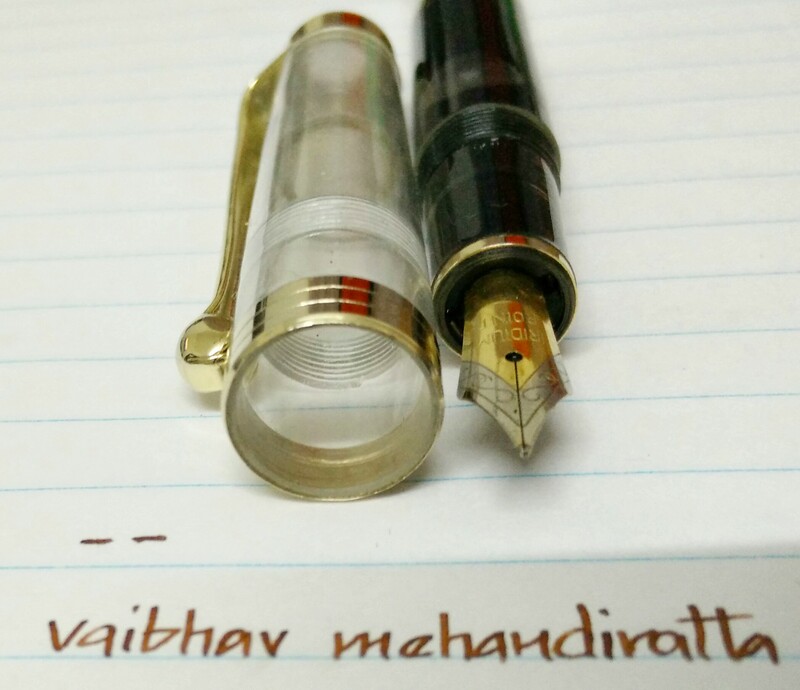 Cant beat the beauty of this pen at this price range. Sir What happened to TITUS fountain pens. Can’t find them anywhere. As if they vanished out of thin air. 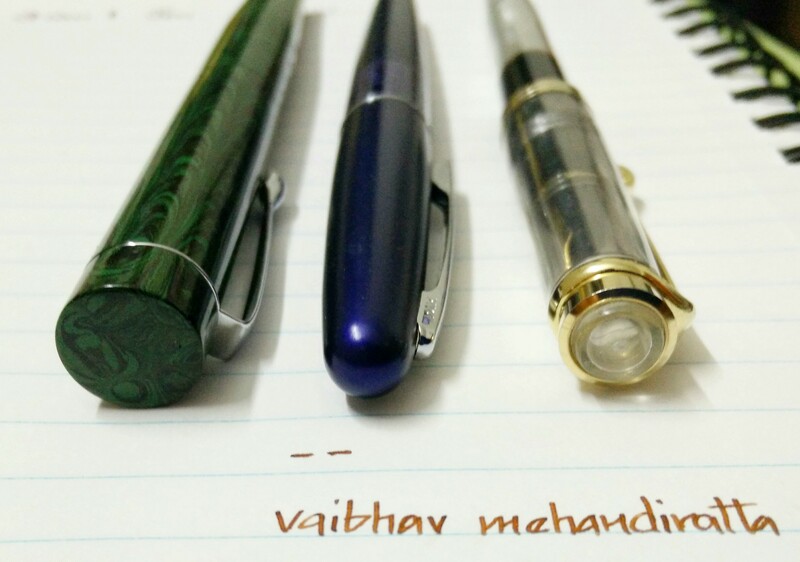 Hi..I am looking for a good Indian fountain pen which will give me good lines for sketching architecture.I have a Lamy which works excellent.but I don’t want any expensive option for another fountain pen.plz recommend.Thanks. Please tell us what that beautiful ink is! How can I order this pen in India? This seems like a Pelikan homage.